Lækjamót has been owned by the same family for more than 200 years. We are a modern Icelandic horse stud farm dedicated to excellence. We offer a comprehensive service designed to meet your needs - in whatever area of Icelandic horsemanship you require service and assistance. We are located halfway between Reykjavik and Akureyri, the two major urban centers in Iceland, and within comfortable travelling distance from both. The farm is vast so our horses roam free and get strong, fit and sure-footed in the challenging terrain. In the summer we take them to the Víðidalstunguheiði highlands - an area of wildlands unsullied by human hands - where they spend the summer with hundreds of other horses from the area, developing a deep rooted sense of individuality and freedom. This builds the horses character and makes them aware of their place within the herds pecking order. This pecking order is exactly what is exploited in the initial training of horses, both in international and Icelandic horsemanship. Thus the highland roaming has the dual benefit of creating a strong sense of self in a young horse and also making it aware of its place within society. This makes the horse easier to train and a more rewarding companion, since it is willing to accept the rider as its leader without losing its unique identity. Þórir Ísólfsson (Thorir): Has been training, breeding, competing and teaching with much sucess for about 40 years. He has a B-teaching qualification and training certificate from FT (Icelandic horse trainers asocciation). He is vastly experienced and has great insight and intuition coupled with a solid knowledged of the best practices in Icelandic horsemanship, both old and new. Holds courses and clinics, gives seminars and individual lessons and custom-makes training programs for you and your horse, whether you wish to compete at a high level or simply get a bit better - and anything in between. Þórir is teaching at Hólar University as a part job. Þórir is available for work in America, Europe and in Iceland. Contact us with your requirements. Elín R. Líndal (Ella): Wife to Þórir, mother of the three siblings, leader of the local council. Need we say more? Born at Lækjamót and therefore on horseback. Sigurður Líndal Þórisson (Siggi): The eldest. Actor and theatre director. Spends most of his time in London and has not ridden professionally or competed for several years. All the same, he still holds the record for the highest score for showjumping in Iceland. Greta Claugh Líndal: Wife to Sigurður. Also an actor. Ísólfur Líndal Þórisson (Iso): The younger son. Has been training horses professionally since 15 years old. Icelandic champion at all junior levels. Winner of 1st prize for riding and training (Morgunblaðsskeifan) at Hvanneyri collage 1998 - the same prize his father won at Hólar collage 25 years earlier! He is educated as a riding teacher from Hólar University-Collage and was teaching at Hólar 2007-2010. Now he lives and works at Lækjamót. Ísólfur has been successful in competitions. Ísólfur is available for courses and clinics, individual and in groups worldwide. Vigdís Gunnarsdóttir: Wife to Ísólfur and mother of their two sons, Ísak Þórir (1999) and Guðmar Hólm (2006). A regular competitor and a keen horsewoman and trainer. Qualified as a social worker from the University of Iceland. Ísak Þórir (1999) and Guðmar Hólm (2006): Sons of Ísólfur and Vigdís. They have been riding since before they could walk, and thereby upholding the tradition of Lækjamót. Ísak is the older son and has more talent than riding horses, he have been on stage acting and there he finds his passion. We believe that the balance on horseback and the connection to a horse that a child gains from starting to ride early, on a suitable horse of course, is irreplaceable and unique. Guðmar the younger son has uniqe passion for horses and is determined of working with horses all his live. Sonja Líndal Þórisdóttir: Only daughter and youngest child. Winner of many honours at junior level, both at the Icelandic championships and "Landsmót". Educated as a professional young horse trainer from Hólar University. Had the highest score in riding at Hólar 2007 and won therefore the eligible Morgunblaðsskeifa. Now studying Veterinarian in Copenhagen and teaching horse owners in Denmark along with the study. Sonja´s fiancee. Friðrik has a Bachelor degree in animal sciences with emphasis on horse breeding from the Agricultural University of Iceland. He has also completed three years of study at the Department of equine science at Hólar University studying equine science, training horses and riding instruction. At Hólar University Friðrik got the got the highest score for young horse training and is the first holder of the young horse trainers cup. 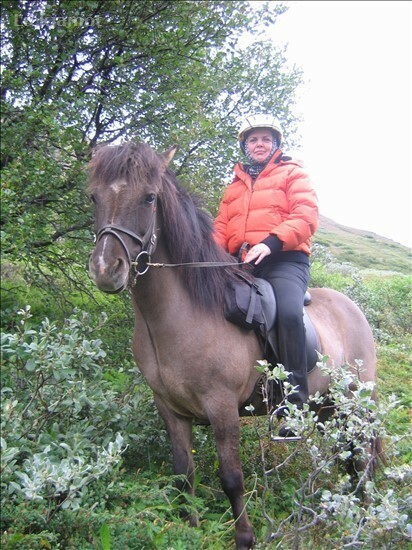 Friðrik has vast knowledge and experience in working with Icelandic horses. He is an international breeding judge for Icelandic horses and judges Icelandic horses at breeding shows worldwide. In addition to judging breeding horses Friðrik mostly works with giving courses and lectures on the Icelandic horse. Our brood mares a rigourously chosen, they are all either first prize mares - or close to it - with some especially desirable qualities. The stallions we use are hand picked for each mare. Thus each foal is a unique individual, bred for the betterment of the line. Our mission is to breed horses with good spirit, good quality in gaits and high leg movements. We want to breed horses that anybody can be proud of, whatever level they are at. We offer a full range of services for the Icelandic horse enthusiast. Courses: We offer courses, clinics, seminars, individual tuition and training assistance to riders of all levels in Europe, Iceland and here at Lækjamót. Four members of the family are educated as riding teachers and/or riding instucturs. Professionalism and experience. The learning experience of our pupils is of paramount importance to us. We aim to provide stimulating, exciting and actionable teaching, knowledge that you can take home with you and use to keep improving your horsemanship. Contact us with your requirements and we´ll give you a quote. Let us find you a horse or come to Iceland and find your horse with our help. Training: We have decades of tradition of training excellence by qualified horsemen. Our facilities are good and the care and training offer the best of traditional methods, but yet completely up to date with modern developments. If you have any other needs or requirements, please don´t hesitate to contact us. You´d be surprised at what we can do! All our offers are made with the presumption of customer demands being within reason and fair intent. We continually strive for fairness in our dealings. A fairly treated customer always comes back, and many have become our friends - we´d like you to be one.